You'll spend time at the Bafflin Sanctuary in Pomfret, sketching and painting nature using pencil, pen and watercolor. Roxanne Steed will show you how to simplify what you see and teach basic drawing and quick intuitive watercolor techniques. Fee: $10 CAS members; $20 non-members. Register at 860-928-4948 and ask for a list of materials to bring. The Connecticut Bird Atlas - Off and Running! Winter winds are blowing so come on down and get cozy at the Coastal Center. 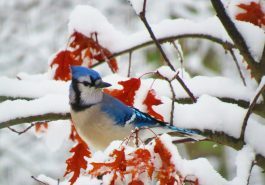 Explore the colors of winter and learn how animals and plants survive the winter months. From blue jays to purple urchins and more, join us for a different colorful adventure each week. Each class includes a story, hands-on activities, and a craft for child and adult to do together. Big January, National Bird Feeding Month, Great Backyard Bird Count, and National Nest Box Week, wow! Bird watching is considered a favorite pastime with over 60 million Americans taking time to look through their binoculars in search of birds and listen for bird calls and songs. Whether you are new to birding or experienced, join us for these guided walks to enjoy the sights and sounds of our year round and winter visiting birds. Miley Bull, senior director of science and conservation, will help identify, share information and answer questions. Visit this stunning landscape to view the animals of the Serengeti! Lions, cheetahs, hyenas, and other predators abound. Visit the Ngorongoro Crater, described as the either wonder of the world; Lake Manyara National Park in the Great Rift Valley; and Oldupai Gorge, where the Leakeys made their famous archaeological discoveries of early hominids. Witness the migration of thousands of wildebeest. Travelers are accompanied by senior director of science and conservation Miley Bull and local guides. Zanzibar Retreat and Kilimanjaro Trek extensions are available. Learn how to operate your digital camera and its many functions. Bring your camera and owner's manual to class. Select one date and please register at 860-928-4948. Free to CAS members; $5 non-members. Spend the day cruising the Rhode Island coast, visiting Charlestown Breachway and Napatree Point. Take the opportunity to see this summertime destination without the tourists. These two locations are always full of birdlife. Leader: Andy Griswold. Join Hampton resident John Wertam, a Trail Wood and poetry enthusiast, for a winter walk at Trail Wood, stopping as whimsy and circumstance dictate to experience nature and read poetry that tries to capture our love of the outdoors. If you are so inclined, bring a copy of your favorite poem that relates to the feeling and awe of being in the presence of nature, put it in your back pocket and maybe we will get a change to share it. Free to CAS members; $5 non-members. An award-winning documentary written and directed by British film-maker Candida Brady. Watch actor Jeremy Irons investigate the global scale and impact of wasteful consumerism and pollution, and discover how communities around the world are reducing consumption toward a goal of zero waste. Q&A after film with Winston Averill, recycling and trash expert from the Quiet Corner. FREE to the public and offered in partnership with the Pomfret Green Team. Join conservation biologist Jim Arrigoni and Stefan Martin, local expert birder on a short nocturnal foray to the edge of the expansive forest at Deer Pond Farm, where we will broadcast the calls of a few of our native owl species to see if we can elicit a response. Sighting or hearing an owl cannot be guaranteed, although the experience of walking in the winter woods under a full moon is sure to memorable. We’ll also discuss the characteristics and ecology of different owl species, the challenges they face in winter, and the ethics of birdwatching in the era of birding apps and Bluetooth speakers. Be sure to dress warmly, and bring a flashlight or headlamp. Join us for this indoor program that will set you on your way to becoming a woodpecker expert. Learn the woodpecker’s role in our back yard ecosystem, how to identify the basic species and their physical characteristics, and how to attract these fascinating birds to your feeders.